In the Convocation holden at London In the Year MDLXII. For the avoiding of Diversities of Opinions, and for the establishing of Consent touching true Religion. Articles agreed upon… for the avoiding of Diversities of Opinions. Whosoever shall affirm that any of the nine and thirty articles are in any part superstitious or erroneous, or such as he may not with a good conscience subscribe unto; let him be excommunicated ipso facto. No man shall put his own sense or Comment to the meaning of the Article, but shall take it in the literal and Grammatical sense. I. Of Faith in the Trinity. THere is but one living and true God, everlasting, without Body, Parts, or Passions; of infinite Power, Wisdom, and Goodness; the Maker and Preserver of all Things both visible and invisible. And in Unity of this Godhead, there be three Persons, of one Substance, Power, and Eternity; the Father, Son, and the Holy Ghost. II. Of Christ the Son of God. Of the Word, or the Son of God, which was made very man. THe Son, which is the Word of the Father, begotten from Everlasting of the Father, the very, and Eternal God, of one Substance with the Father, took Man’s Nature in the Womb of the blessed Virgin, of her substance: so that two whole and perfect Natures, that is to say, the Godhead, and Manhood were joined together in one Person, never to be divided, whereof is one Christ, very God, and very man, who truly suffered, was Crucified, dead and buried, to reconcile His Father to us, and to be a Sacrifice, not only for Original Guilt, but also for actual sins of men. III. Of His going down into Hell. Of the Going down of Christ into Hell. AS Christ died for us, and was buried: so also is it to be believed that He went down into Hell. CHrist did truly rise again from Death, and took again His body, with flesh, bones, and all things appertaining to the perfection of man’s Nature, wherewith He ascended into Heaven, and there sitteth, until He return to judge all men at the last Day. THe Holy Ghost, proceeding from the Father and the Son, is of one Substance, Majesty and Glory, with the Father and the Son, Very and Eternal God. VI. Of the Sufficiency of the Scripture. Of the Sufficiency of the Holy Scriptures for Salvation. HOly Scripture containeth all things necessary to Salvation; so that whatsoever is not read therein, nor may be proved thereby, is not to be required of any man, that it should be believed as an Article of the Faith, or be thought requisite or necessary to Salvation. In the name of the Holy Scripture, we do understand those Canonical Books of the Old and New Testament, of whose Authority was never any doubt in the Church. ¶ Of the Names and Number of the Canonical Books. The 2. Book of Maccabees. All the Books of the New Testament, as they are commonly received, we do receive and account them Canonical. THe Old Testament is not contrary to the New: for both in the Old and New Testament, Everlasting Life is offered to Mankind by Christ, who is the only Mediator between God & man, being both God and Man. Wherefore they are not to be heard, which feign that the old fathers did look only for transitory promises. Altho’ the Law given from God by Moses, as touching Ceremonies and Rites, do not bind Christian men, nor the Civil precepts thereof ought of Necessity to be received in any CommonsWealth: yet notwithstanding, no Christian man whatsoever, is free from the Obedience of the Commandments which are called moral. THe Three Creeds, Nice Creed, Athanasius Creed, and that which is commonly called the Apostles Creed, ought thoroughly to be received and believed: for they may be proved by most certain Warrants of Holy Scripture. Of original Birth or Sin. ORiginal Sin standeth not in the Following of Adam (as the Pelagians do vainly talk) but it is the Fault, and Corruption, of the Nature of every man that naturally is engendered of the offspring of Adam, whereby man is very far gone from original Righteousness, and is of his own nature inclined to evil, so that the Flesh lusteth always contrary to the Spirit; and therefore in every Person born into this world, it deserveth God‘s Wrath, and Damnation. And this infection of nature doth remain, yea, in them that are regenerated; whereby the Lust of the Flesh, called in Greek, phronema sarkos, which some do expound the wisdom, some sensuality, some the affection, some the desire of the Flesh, is not subject to the Law of God. And altho’ there is no Condemnation for them that believe and are Baptized, yet the Apostle doth confess, that Concupiscence and Lust hath of itself the nature of Sin. THe Condition of man after the Fall of Adam is such, That he cannot turn & prepare himself by his own natural strength & good works, to Faith and Calling upon God: Wherefore we have no Power to do Good Works pleasant and acceptable to God, without the Grace of God by Christ preventing us, that we may have a good Will, and working with us when we have that good Will. Of the Justification of man. ALbeit that Good works, which are the Fruits of Faith, and follow after Justification, cannot put away our Sins, and endure the Severity of God’s Judgment, yet are they pleasing and acceptable to God in Christ, and do spring out necessarily of a true and lively Faith, insomuch that by them a lively Faith may be as evidently known, as a tree discerned by the Fruit. WOrks done before the Grace of Christ, and the inspiration of His Spirit, are not pleasant to God, forasmuch as they spring not of Faith in Jesu Christ, neither do they make men meet to receive grace, or (as the School Authors say) deserve Grace of Congruity: yea, rather for that they are not done as God hath willed and commanded them to be done, we doubt not but they have the nature of Sin. VOluntary Works besides, over and above God’s Commandments, which they call Works of Supererogation, cannot be taught without Arrogancy and Impiety. For by them men do declare, that they do not only render unto God as much as they are bound to do, but that they do more for his sake than of bounden duty is required: whereas Christ saith plainly, When ye have done all that are commanded to you, say, we are unprofitable servants. Of Christ alone without Sin. Christ in the truth of our nature, was made like unto us in all things, Sin only except, from which He was clearly void, both in His flesh and in Spirit. He came to be a Lamb without spot, who by Sacrifice of Himself once made, should take away the sins of the World: and Sin (as St. John saith) was not in Him. But all we, the rest, altho’ Baptized and born again in Christ, yet offend in many things, and if we say we have no sin, we deceive our selves and the Truth is not in us. NOt every deadly Sin willingly committed after Baptism, is Sin against the Holy Ghost, and unpardonable: Wherefore the Grant of Repentance is not to be denied to such as fall into sin after Baptism. After we have received the Holy Ghost, we may depart from Grace given, and fall into sin, and by the Grace of God, we may arise again, & amend our Lives. And therefore they are to be condemned, which say they can no more sin as long as they live here, to deny the place of Forgiveness to such as truly repent. PRedestination to Life, is the everlasting purpose of God, whereby (before the Foundations of the world were laid) He hath constantly Decreed by His Counsel, secret to us, to deliver from Curse and Damnation, those whom He hath chosen in Christ out of Mankind, and to bring them by Christ to everlasting Salvation, as vessels made to Honour. Wherefore they which be endued with so excellent a Benefit of God, be called according to God’s purpose by His Spirit working in due season: they through Grace obey the Calling: they be justified freely: they be made sons of God by Adoption: they be made like the Image of His only begotten Son Jesus Christ: they walk religiously in Good Works, and at length by God‘s Mercy they attain to everlasting Felicity. As the godly Consideration of predestination, and our Election in Christ, is full of sweet, pleasant, and unspeakable Comfort to godly persons, and such as feel in themselves the working of the Spirit of Christ, mortifying the works of the Flesh, and their earthly Members, and drawing up their mind to high and heavenly things, as well because it doth greatly establish & confirm their Faith of eternal Salvation, to be enjoyed through Christ, as because it doth frequently kindle their Love towards God: So, for curious and carnal persons, lacking the Spirit of Christ, to have continually before their eyes the sentence of God’s Predestination, is a most dangerous down-fall, whereby the devil doth thrust them either into desperation, or into wretchlessness of unclean Living, no less perilous than Desperation. Furthermore, we must receive God’s Promises in such wise as they be generally set forth to us in Holy Scripture: and in our Doings, that Will of God is to be followed, which we have expressly declared unto us in the word of God. XVIII. Of obtaining Salvation by Christ. Of obtaining eternal Salvation only by the name of Christ. THey also are to be had accursed, that presume to say, That every man shall be saved by the Law or Sect which he professeth, so that he be diligent to frame his life according to that Law, and the light of nature: For holy Scripture doth set out unto us only the Name of Jesus Christ, whereby men must be saved. THe visible Church of Christ is a Congregation of Faithful men, in the which the pure Word of God is preached, and the Sacraments be duly Ministered, according to Christ’s Ordinance in all those things that of necessity are requisite to the same. As the Church of Hierusalem, Alexandria, and Antioch have erred; So also the Church of Rome hath erred, not only in their Living and manner of Ceremonies, but also in matters of Faith. Of the Authority of the Church. THe Church hath Power to decree Rites or Ceremonies, and Authority in Controversies of Faith: And yet it is not lawful for the Church to ordain any thing that is contrary to God’s Word written, neither may it so expound one place of Scripture, that it be repugnant to another. Wherefore although the Church be a Witness and a Keeper of holy Writ, yet as it ought not to decree any thing against the same, so besides the same ought it not to enforce any thing to be believed for necessity of Salvation. Of the Authority of General Councils. GEneral Councils may not be gathered together without the Commandment and Will of Princes: and when they be gathered together (forasmuch as they be an assembly of men, whereof all be not governed with the Spirit and Word of God) they may err, & sometime have erred, even in things pertaining unto God. Wherefore things ordained by them as necessary to Salvation, have neither Strength nor Authority, unless it may be declared that they be taken out of holy Scripture. THe Romish Doctrine concerning Purgatory, Pardons, Worshipping and Adoration, as well of Images, as of Reliques; and also Invocation of Saints, is a fond thing, vainly invented, & grounded upon no Warranty of Scripture, but rather Repugnant to the Word of God. Of Ministering in the Congregation. IT is not lawful for any man to take upon him the Office of publick Preaching, or Ministering the Sacraments in the Congregation, before he be lawfully Called and sent to execute the same: and those we ought to judge lawfully called & sent, which be chosen & called to this work by men who have publick Authority given unto them in the Congregation, to call and send Ministers into the Lord’s Vineyard. XXIV. Of Speaking in the Congregation. Of Speaking in the Congregation in such a Tongue as the People understandeth. IT is a thing plainly repugnant to the Word of God & the Custom of the primitive Church, to have publick prayer in the Church, or to Minister the Sacraments in a Tongue not understood by the People. SAcraments ordained of Christ, be not only Badges or tokens of Christian men’s Profession; but rather they be certain sure Witnesses, and effectual Signs of Grace, and God’s Good Will towards us, by the which He doth work invisibly in us, and doth not only quicken but also strengthen and confirm our Faith in Him. Those five commonly called Sacraments, that is to say, Confirmation, Penance, Orders, Matrimony, and Extreme Unction, are not to be counted for Sacraments of the Gospel, being such as have grown, partly of the corrupt following of the Apostles, partly are states of life allowed by the Scriptures: but yet have not like nature of Sacraments, with Baptism and the Lord’s Supper, for that they have not any visible Sign or Ceremony ordained of God. The Sacraments were not ordained of Christ to be gazed upon, or to be Carried about, but that we should duly use them. And in such only as worthily receive the same, they have a wholesome effect or operation: but they that receive them unworthily, purchase to themselves Damnation, as St. Paul saith. XXVI. Of the Worthiness of Ministers. Of the unworthiness of the Ministers which hinders not the Effects of the Sacraments. ALthough in the visible Church the evil be ever mingled with the good, and sometime the evil have chief Authority in the Ministration of the Word and Sacraments; yet forasmuch as they do not the same in their own Name, but in Christ’s, and do minister by His Commission and Authority, we may use their Ministry, both in hearing the Word of God, and in receiving of the Sacraments. Neither is the Effect of Christ’s Ordinance taken away by their wickedness, nor the grace of God’s Gifts diminished from such, as by Faith, and rightly do Receive the Sacraments ministered unto them, which be effectual, because of Christ’s Institution & Promise, although they be ministered by evil men. Nevertheless, it appertaineth to the Discipline of the Church, that enquiry be made of evil ministers, and that they be accused by those that have knowledge of their Offences: and finally being found guilty, by just Judgment be deposed. BAptism is not only a Sign of Profession, and mark of Difference whereby Christian men are discerned from others that be not Christened: but it is also a sign of Regeneration or new Birth, whereby, as by an instrument, they that receive Baptism rightly, are grafted into the Church: the promises of the Forgiveness of sin, and of our adoption to be the Sons of God, by the Holy Ghost, are visibly signed and sealed: Faith is confirmed, and Grace increased by virtue of Prayer unto God. The Baptism of young Children is in any wise to be retained in the Church, as most agreeable with the Institution of Christ. THe Supper of the Lord is not only a sign of the Love that Christians ought to have among themselves one to another: but rather it is a Sacrament of our Redemption by Christ’s Death: insomuch that to such as rightly, worthily, and with Faith receive the same, the Bread which we break, is a partaking of the Body of Christ; and likewise the Cup of Blessing is a partaking of the Blood of Christ. Transubstantiation (or the Change of the Substance of Bread and Wine) in the Supper of the Lord, cannot be proved by Holy Writ: but it is repugnant to the plain words of Scripture, overthroweth the Nature of a Sacrament, and hath given occasion to many Superstitions. The Body of Christ is given, taken, and eaten in the Supper only after an heavenly & spiritual manner. And the mean whereby the Body of Christ is received and eaten in the Lords Supper is Faith. The Sacrament of the Lord’s Supper, was not by Christ’s Ordinance Reserved, Carried about, lifted up, or worshipped. XXIX. The Wicked not eating the Body of Christ. Of the wicked, which eat not the Body of Christ in the use of the Lord’s Supper. THe wicked and such as be void of a lively Faith, altho’ they do carnally & visibly press with their Teeth (as St. Augustine saith) the Sacrament of the Body & Blood of Christ: yet in no wise are they partakers of Christ; but rather to their Condemnation do eat and drink the sign or Sacrament of so great a thing. THe Cup of the Lord is not to be denied to the Lay-people: for both the parts of the Lord’s Sacrament by Christ’s Ordinance & Commandment, ought to be ministered to all Christian men alike. Of the one Oblation of Christ, finished upon the Cross. THe Offering of Christ once made, is that perfect Redemption, Propitiation, and Satisfaction, for all the sins of the whole world, both Original and Actual, and there is none other Satisfaction for sin, but that alone. Wherefore the Sacrifices of Masses, in the which it was commonly said, that the Priest did offer Christ for the quick and the dead, to have Remission of pain or guilt, were blasphemous Fables and dangerous Deceits. Of the Marriage of Priests. BIshops, Priests, and Deacons, are not commanded by God’s Law, either to vow the state of single Life, or to abstain from Marriage : Therefore it is lawful for them, as for all other Christian men, to marry at their own Discretion, as they shall judge the same to serve better to Godliness. Of Excommunicate Persons, how they are to be avoided. THat person which by open Denunciation of the Church, is rightly cut off from the Unity of the Church, and excommunicated, ought to be taken of the whole multitude of the faithful, as an Heathen and Publican, until he be openly reconciled by Penance, and received into the Church by a Judge that hath Authority thereunto. Of the Traditions of the Church. IT is not necessary that Traditions and Ceremonies be in all places one, or utterly like; for at all times they have been divers, and may be changed according to the Diversity of Countries, times, & men’s Manners, so that nothing be ordained against God’s Word. Whosoever through his private Judgment, willingly, & purposely doth openly break the Traditions and Ceremonies of the Church which be not repugnant to the Word of God, and be Ordained and Approved by common Authority, ought to be rebuked openly, (that others may fear to do the like) as he that offendeth against the Common Order of the Church, and hurteth the Authority of the Magistrate, and woundeth the Consciences of the weak Brethren. Every particular or National Church, hath Authority to ordain, change, and abolish Ceremonies or Rites of the Church, ordained only by man‘s Authority, so that all things be done to edifying. 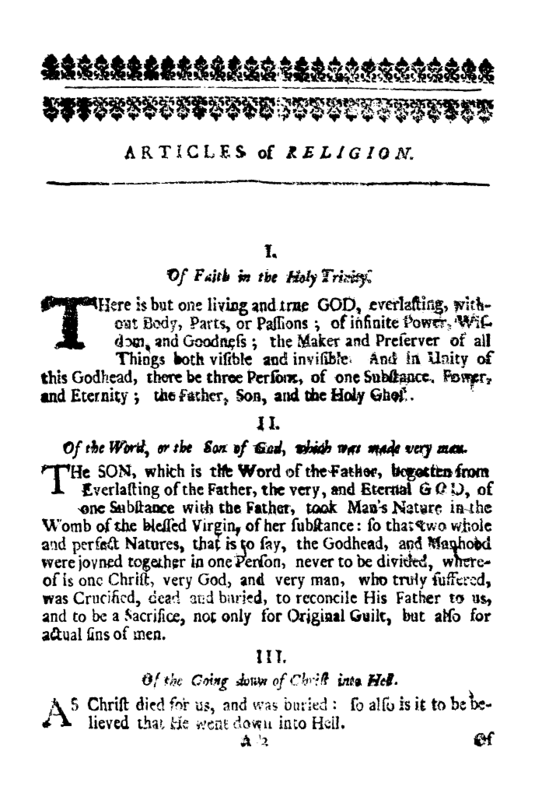 THe 2nd Book of Homilies, the several Titles whereof we have joined under this Article, doth contain a godly & wholesome Doctrine, and necessary for these times, as doth the former Book of Homilies, which were set forth in the time of Edward the 6th; and therefore we judge them to be read in Churches by the Ministers, diligently & distinctly that they may be understood of the People. ¶ Of the Names of the Homilies. 3 Of Repairing & keeping clean of Churches. 4 Of Good Works, 1st Fasting. 5 Against Gluttony & Drunkenness. 8 Of the Place & Time of Prayer. ments ought to be ministered in a known Tongue. 10 Of the reverend Estimation of God’s Word. 15 Of the worthy Receiving of the Sacrament of the Body & Blood of Christ. 17 For the Rogation Days. XXXVI. Of Consecration of Ministers. Of Consecration of Bishops and Ministers. 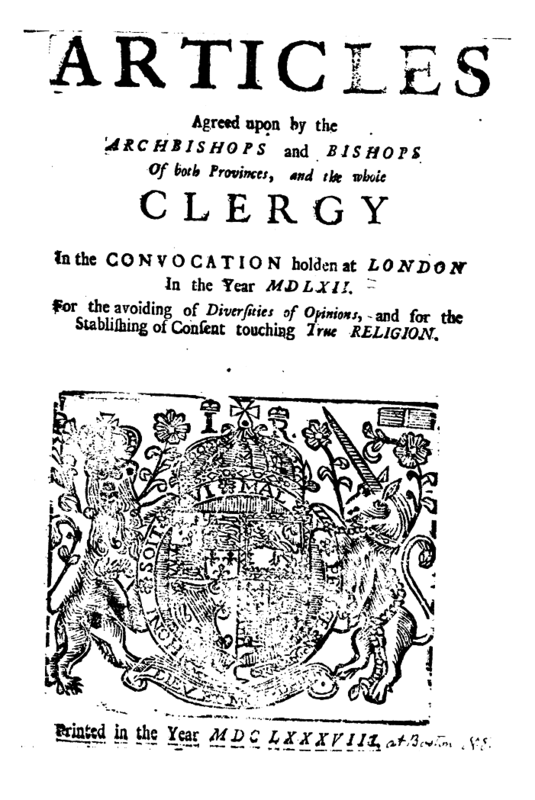 THe Book of Consecration of Archbishops & Bishops, and Ordering of Priests & Deacons, lately set forth in the time of Edward the 6. and confirmed at the same time by Authority of Parliament, doth contain all things necessary to such Consecration & Ordering: neither hath it any thing that of it self is superstitious and ungodly. And therefore whosoever are Consecrated, or Ordered according to the Rites of that Book, since the 2nd year of the aforenamed K. Edward, unto this time, or hereafter shall be Consecrated or Ordered according to the same Rites, we decree all such to be rightly, orderly, and lawfully Consecrated & Ordered. THe Queen’s Majesty hath the chief Power in this Realm of England, and other Her Dominions, unto whom the chief Government of all Estates of this Realm, whether they be Ecclesiastical or Civil, in all Causes doth appertain, and is not, nor ought to be subject to any foreign Jurisdiction. Where we attribute to the Queen’s Majesty the Chief Government, by which Titles we understand the minds of some slanderous folks to be offended: we give not our Princes the ministering either of God’s Word, or of the Sacraments, the which thing the Injunctions also lately set forth by Elizabeth our Queen, do most plainly testify: but that only Prerogative, which we see to have been given always to all godly Princes in holy Scriptures by God Himself, that is, that they should Rule all Estates & Degrees committed to their Charge by God, whether they be Ecclesiastical or Temporal, and restrain with the Civil Sword the stubborn and evil Doers. The Laws of this Realm may punish Christian men with death, for hainous and grievous Offences. Of Christian men’s Goods which are not Common. THe Riches & Goods of Christians are not Common, as touching the Right, Title, & Possession of the same, as certain Anabaptists do falsly boast. Notwithstanding, every man ought of such things as he possesseth, liberally to give Alms to the poor, according to his Ability. Of A Christian man’s Oath. AS we confess that vain & rash Swearing is forbidden Christian men by our Lord Jesus Christ, & James His Apostle; so we judge that Christian Religion doth not prohibit, but that a man may Swear when the Magistrate requireth, in a Cause of Faith and Charity, so it be done according to the Prophet’s Teaching, in Justice, Judgment, and Truth. THis Book of Articles before rehearsed, is again approved, and allowed to be holden & executed within the Realm, by the Assent and Consent of our Sovereign Lady Elizabeth, by the Grace of God, of England, France, and Ireland Queen, Defender of the Faith, &c. Which Articles were deliberately read, and confirmed again by the Subscription of the Hands of the Archbishop & Bishops of the Upper House, and by the Subscription of the whole Clergy of the Nether House in their Convocation, in the Year of our Lord, 1571. 1 OF Faith in the Trinity. 2 Of Christ the Son of God. 3 Of His going down into Hell. 5 Of the Holy Ghost. 6 Of the Sufficiency of the Scriptures. 7 Of the Old Testament. 8 Of the Three Creeds. 13 Of Works before Justification. 14 Of Works of Supererogation. 15 Of Christ alone without sin. 16 Of Sin after Baptism. 17 Of Predestination and Election. 18 Of obtaining Salvation by Christ. 20 Of the Authority of the Church. 21 Of the Authority of General Councils. 22 Of Purgatory. ( gation. 24 Of Speaking in the Congregation. 26 Of the Worthiness of Ministers. 28 Of the Lord’s Supper. 29 Of the Wicked, which eat not the Body of Christ. 32 Of the Marriage of Priests. 34 Of the Traditions of the Church. 36 Of Consecration of Ministers. 38 Of Christian men’s Goods. 39 Of a Christian man’s Oath. Quotes at the top are adapted from the sources from which they are cited. 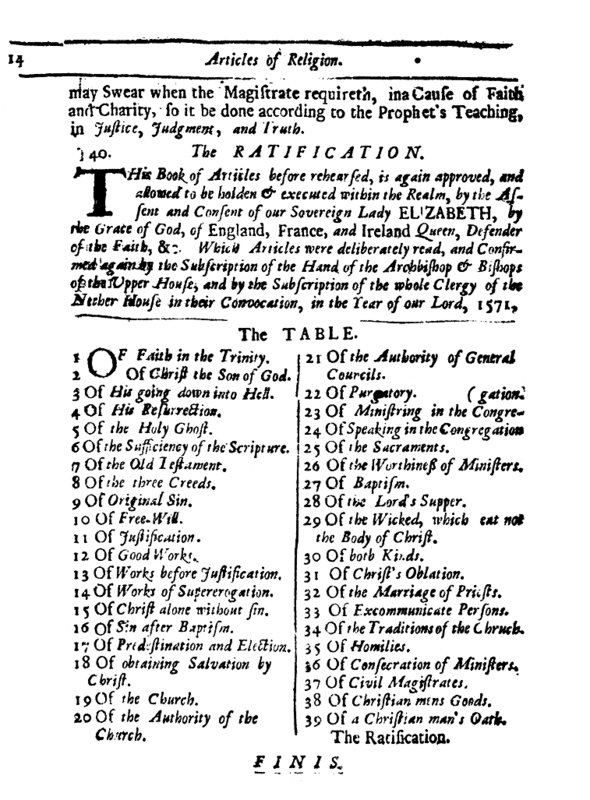 Table of Contents is drawn from the 1688 ed. Some apostrophes added in consonance with modern usage. "joyned", "stablished", "throughly", "ingendred", "wholsom", "ministred", "publicane" and "countreys" amended in consonance with modern spelling. Colons and semicolons amended where necessary in consonance with modern usage. Books of Scripture spelled in consonance with modern usage. XVIII. Of Salvation only by Christ. XXIII. Of Ministering in Congregation. XXIV. Of Speaking in common tongue. XXIX. Of Wicked not eating the Body. XXXIV. Of Traditions of the Church. XXXVIII. Of Christian mens Goods.